Recurrent and concurrent subacute stent thrombosis of two coronary arteries in a schizophrenic patient. Citation: Ozbek B, Baysal SS, Ilter Z, et al. Recurrent and concurrent subacute stent thrombosis of two coronary arteries in a schizophrenic patient. J Pharmacol Ther Res 2018;2(4):1-3. Subacute stent thrombosis after acute coronary syndrome and concurrent thrombosis of multiple coronary arteries are rare complications. Schizophrenia and antipsychotic drugs cause hypercoagulability, and rates of cardiovascular mortality are higher in schizophrenic patients compared with the normal population. We want to discuss a case of recurrent and concurrent subacute left anterior descending artery and right coronary artery stent thrombosis after acute myocardial infarction in a schizophrenic patient. Learning Objectives: Schizophrenia and antipsychotic medications should be considered risk factors for acute and subacute stent thrombosis in patients treated with percutaneous coronary stent implantation. Intensive antiplatelet therapy should be considered for patients with schizophrenia on antipsychotic treatment who undergo percutaneous coronary intervention. Subacute stent thrombosis after acute coronary syndrome and concurrent thrombosis of multiple coronary arteries are rare complications [1,2]. Schizophrenia and antipsychotic drugs cause hypercoagulability, and rates of cardiovascular mortality are higher in schizophrenic patients compared to the normal population [3,4]. We treated a case of recurrent and concurrent subacute left anterior descending (LAD) artery-and right coronary artery (RCA)-stent thrombosis after acute myocardial infarction (MI) in a schizophrenic patient treated with the antipsychotics olanzapine and apiprazole. A 55-year-old male with acute anterior MI and cardiogenic shock was referred to our hospital from a non-interventional hospital. The patient, who had ongoing chest pain and presented with ST elevation on an electrocardiogram, immediately underwent cardiac catheterization. A left selective coronary angiography showed total occlusion and thrombosis of the LAD artery from the proximal segment to the previously implanted stent. Successful primary percutaneous coronary intervention (PCI) was performed on the LAD artery lesion. Diagnostic catheterization revealed that the RCA was also completely obstructed and thrombosed from the proximal segment to the previously implanted stent. Successful primary PCI was then performed on the RCA (Figure 1). Figure 1. 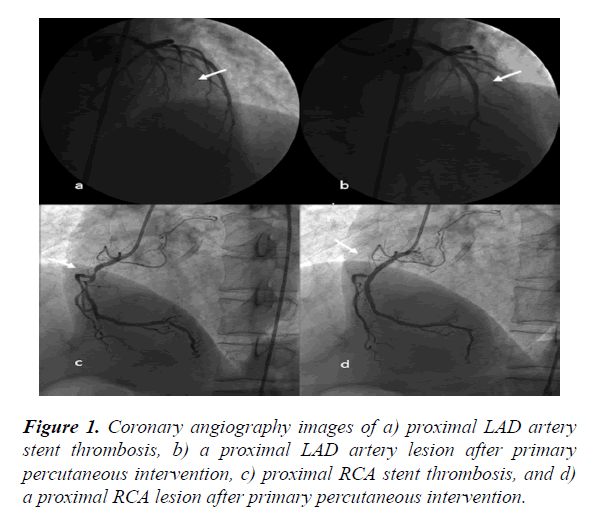 Coronary angiography images of a) proximal LAD artery stent thrombosis, b) a proximal LAD artery lesion after primary percutaneous intervention, c) proximal RCA stent thrombosis, and d) a proximal RCA lesion after primary percutaneous intervention. It was learned the patient had anterior MI 12 days before presentation at our hospital. Primary PCI was initially performed to treat the patient’s proximal LAD artery stenosis, which had presented as acute anterior MI at another hospital 12 days previously (Figure 2(a-b)). 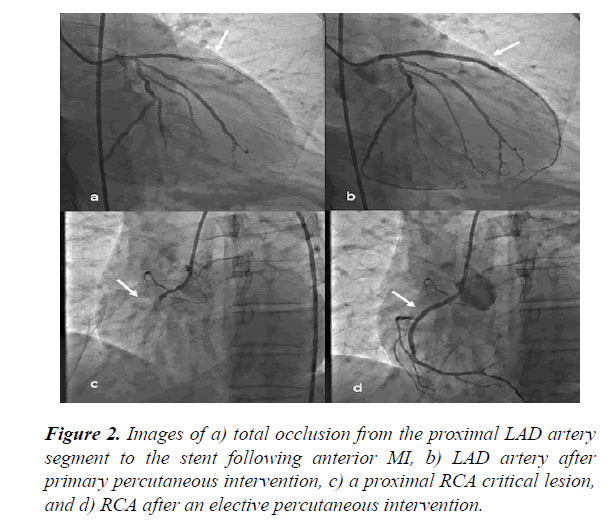 Elective PCI was also performed on the proximal RCA lesion 4 days after the MI (Figure 2(c,d)). Two days after implantation of an RCA stent, the patient presented with chest pain recurrence and a dynamic change on ECG (Figure 3). It was determined that the LAD artery stent had become thrombosed, and intervention of the LAD artery was repeated. Medical records indicated that acetylsalicylic and ticagrelor therapies had been initiated as a dual antiplatelet therapy prior to thrombosis of the stent. Following stent thrombosis, the dual therapy was replaced with acetylsalicylic acid, clopidogrel, and warfarin. The patient’s international normalized ratio was 2.1 upon discharge from the hospital. Figure 2. Images of a) total occlusion from the proximal LAD artery segment to the stent following anterior MI, b) LAD artery after primary percutaneous intervention, c) a proximal RCA critical lesion, and d) RCA after an elective percutaneous intervention. Figure 3. Proximal LAD artery subacute stent thrombosis and repeated primary intervention to the LAD artery after 2 days with an elective RCA stent. After the procedure, a detailed medical history revealed that the patient had been suffering from schizophrenia for 20 years and was receiving antipsychotic treatment. The patient had a history of coronary artery disease, and an elective LAD artery stent was implanted for 6 years. We initiated the dual antiplatelet treatment of acetyl salicylic acid and ticagrelor, because the patient was at high risk for stent thrombosis. In addition to the initial treatment, enoxaparin (0.5 mg/kg) was administered to the patient twice a day for 1 one week, and once a day for 3 weeks after the procedure. No additional complications were observed in the patient over a 3-month follow-up period. Stent thrombosis is a life-threatening complication of percutaneous coronary intervention that rarely occurs due to advances in stent technology and antiplatelet agents . Early antiplatelet therapy discontinuation, number and length of the stents, admission with acute coronary syndrome, diabetes, smoking, and bifurcation or ostial disease are important risk factors for acute stent thrombosis . In this case, the presence of thrombosis in more than one coronary artery under intensive medical treatment is suggestive of a new potential systemic factor for stent thrombosis etiology. Several hypotheses have been proposed to explain the onset of schizophrenia. The most accepted hypothesis suggests that environmental triggers, in the presence of a genetic background, prompt the development of psychotic symptoms . Impairment of the coagulation and fibrinolysis system and decreased activities of tissue plasminogen activator and protein S have also been implicated in the pathophysiology of schizophrenia and may increase the risk of thromboembolic events in schizophrenic patients . Several studies have found that antipsychotic drugs are associated with hypercoagulable states, venous thromboembolism, and pulmonary embolisms in schizophrenic patients [3,7]. However, no study has found a relationship of schizophrenia or antipsychotic drugs with arterial or coronary thrombosis. In this unique case, concurrent thrombosis of two coronary arteries under intensive antiplatelet therapy suggests a relationship with hypercoagulable states. Antipsychotic treatment was discontinued for 1 month following the procedure. We initiated triple therapy by adding enoxaparin to the dual antiplatelet treatment. Schizophrenia and antipsychotic medications should be considered risk factors for acute and subacute stent thrombosis in patients treated with percutaneous coronary stent implantation. Intensive antiplatelet therapy should be considered for patients with schizophrenia on antipsychotic treatment who undergo percutaneous coronary intervention. We thank the staff in the Hospital Catheter Laboratory (Isa Aktas, Lutfu Banuk) for their support. Modi K, Bhimji SS. Stent thrombosis. StatPearls. Treasure Island (FL) 2017. Edem E, Varim P, Pabuccu MT, et al. Acute myocardial infarction due to simultaneous occlusions of the left anterior descending artery and right coronary artery. BMJ Case Rep. 2015;2015(2):bcr2015209941. Chow V, Reddel C, Pennings G, et al. Global hypercoagulability in patients with schizophrenia receiving long-term antipsychotic therapy. Schizophr Res. 2015;162(1-3):175-82. Fan Z, Wu Y, Shen J, et al. Schizophrenia and the risk of cardiovascular diseases: a meta-analysis of thirteen cohort studies. J Psychiatr Res. 2013;47(11):1549-56. D'Ascenzo F, Bollati M, Clementi F, et al. Incidence and predictors of coronary stent thrombosis: Evidence from an international collaborative meta-analysis including 30 studies, 221,066 patients, and 4276 thromboses. Int J Cardiol. 2013;167(2):575-84. Hoirisch-Clapauch S, Amaral OB, Mezzasalma MA, et al. Dysfunction in the coagulation system and schizophrenia. Transl Psychiatry. 2016;6(1):e704. Hsu WY, Lane HY, Lin CL, et al. A population-based cohort study on deep vein thrombosis and pulmonary embolism among schizophrenia patients. Schizophr Res. 2015;162(1-3):248-52.